Sandmenschen in Rio (English text s. below). Rio de Janeiro, Brasilien. – Rios historischer Name „São Sebastião do Rio de Janeiro“, wörtlich „Heiliger Sebastian vom Januarfluss”, ist eigentlich ein Irrtum. Als die portugiesischen Seefahrer 1502 die Bucht entdeckten, hielten sie sie irrtümlich für einen Fluss. Die Guanabara-Bucht ist heute als “Plastikbucht” bekannt. Sie ist hochgradig verseucht, unfassbare Mengen von Müll schwimmen auf dem bakterienverseuchten Wasser. Daher leben die brasilianische Elite und die Touristen auf der anderen Seite der Stadt, z.B. in Copacabana oder Ipanema, den Stadtvierteln am Atlantischen Ozean. Copacabana, der berühmteste Strand der Welt. Natürlich sind uns alle Klischees bewusst. Und trotzdem, er ist magisch! Die tosende Brandung, der feine Sand, die Flaneure, die Sonnenanbeter, die Beach-Volleyballer, die Havaiana-(Flipflop)-Verkäufer. 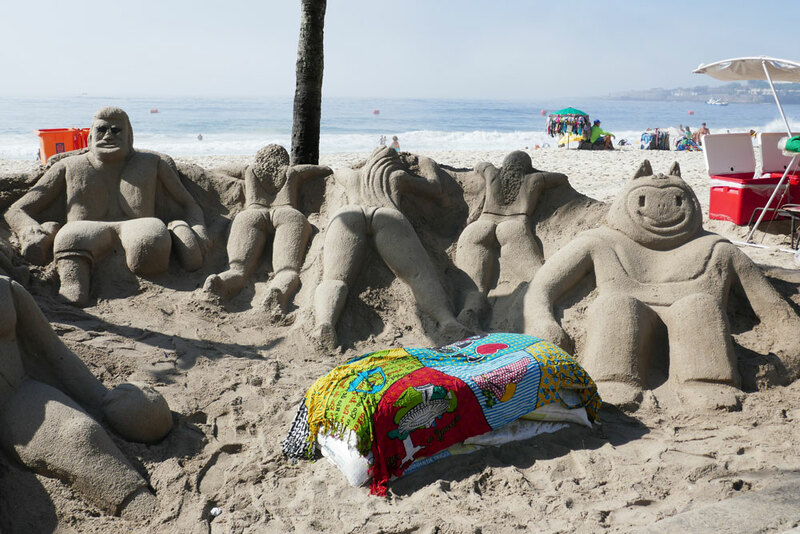 Die Cariocas, wie die Einwohner von Rio sich nennen, leben am Strand. Menschen des Sands, Sandmenschen. Rio de Janeiro, Brazil. – Rio’s historical name “São Sebastião do Rio de Janeiro“, which literally means “San Sebastian of the River January“, is actally an error. When the Portuguese ships discovered the bay in 1502, they mistook it for a river. Today, the Guanabara Bay is known as “plastics bay”. It is a dumping ground for sewage and trash, the water is highly toxic and contaminated with bacteria. Therefore, the Brazilian elite and the tourists live on the other side of the city, e.g. in Copacabana and Ipanema, the districts on the Atlantic Ocean. Copacabana, the most famous beach of the world. Of course, we are aware of all clichés. But still, it’s magical! The surging waves, the fine grains of sand, the flaneurs, the sun worshippers, the beach volley players, the havaiana (flip flops) vendours. The cariocas as the Rio inhabitants call themselves live on the beach. People of the sand, sand people.